Fly fishing. Just saying it aloud is scary. 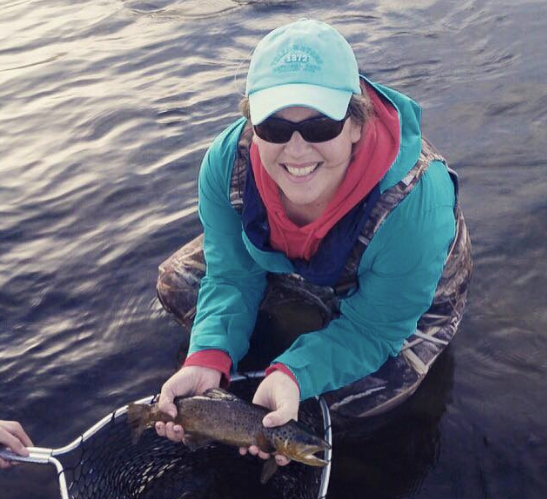 For a gal from Mississippi, fly fishing isn’t something I learned while growing up. I’ve seen it in movies, magazines and heard folks talk about it around the office, but never did I dare try to tackle this daunting form of fishing. Trish with her first fish caught on a fly. A beautiful Weber brown. Well, that all changed. I went fly fishing and I actually caught a fish — two in fact, and it was amazing! Let me tell you the story. The boys from Twin Territory have invited me to go fishing with them several times, but my schedule has always been crazy full. By the way, AJ and Jace — the boys of Twin Territory — strive to get kids off the couch and outdoors. 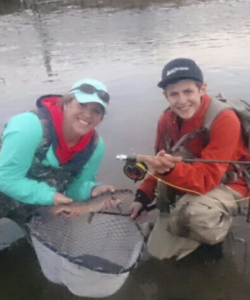 They, along with their little brother Cameron, lead fishing and hunting events and participate in a bunch of outdoor endeavors throughout Utah. They run a trade program that enters kids into a drawing for outdoor gear in exchange for their old video games. They then donate those video games to kids at Primary Children’s Hospital. They’re great kids who run a great program. A couple months ago, the stars aligned and my time to fly fish arrived. I was nervous. Fly fishing is tricky business. I’ve attended the Wasatch Fly Tying and Fly Fishing Expo for several years and, from the looks of all the serious fly anglers there, it’s serious fishing. Very technical and complicated — not very Trish-like. In preparation for my big adventure, I went out and bought some very fancy camo waders. (I wanted something that could serve double duty for hunting and fishing.) I packed some snacks, my bright blue jacket, a hat and my fancy new waders and set off to meet the guys. The fishing party consisted of AJ (my fishing guru), Jace, James (another DWR employee) and Alex (the dad). We set off to conquer the mighty Weber River. There was lots of talk of flies, rigging, fish and tackle — all foreign to me. It had rained recently so selecting a spot with not-so-murky water was key. Trish and AJ catching Weber brown trout. We made our way to the river and AJ began showing me how to cast and what to do with the line. Finally, it was my turn. Casting is all in the wrist. I was trying to hurl it down the river like a football. It wasn’t working all that well, BUT, I got a bite. I wasn’t ready for a bite, much less to catch a fish. I hooked the fish, he fought a bit and I missed him. I was very concentrated on the casting and mending sequence and not so concerned with the fish. After many, many attempts at casting and mending, I started to get better. As we moved along the river, I got a lot of bites and hooked several fish, but couldn’t seem to get them to the net. We decided to move to a secret honey hole the twins fish on occasion. They always seem to have luck there, so off we went. By the way, I’ll take this time to mention that James, or Outdoor Recreation Specialist from the Northern Region DWR, had yet to get a bite. I was rubbing it in just a little bit (okay, a lot) when we made our way to the secret spot. 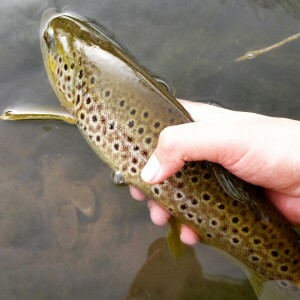 A brown trout being released. It was pandemonium and I was ecstatic! My first fish caught on a fly, and he wasn’t too shabby. 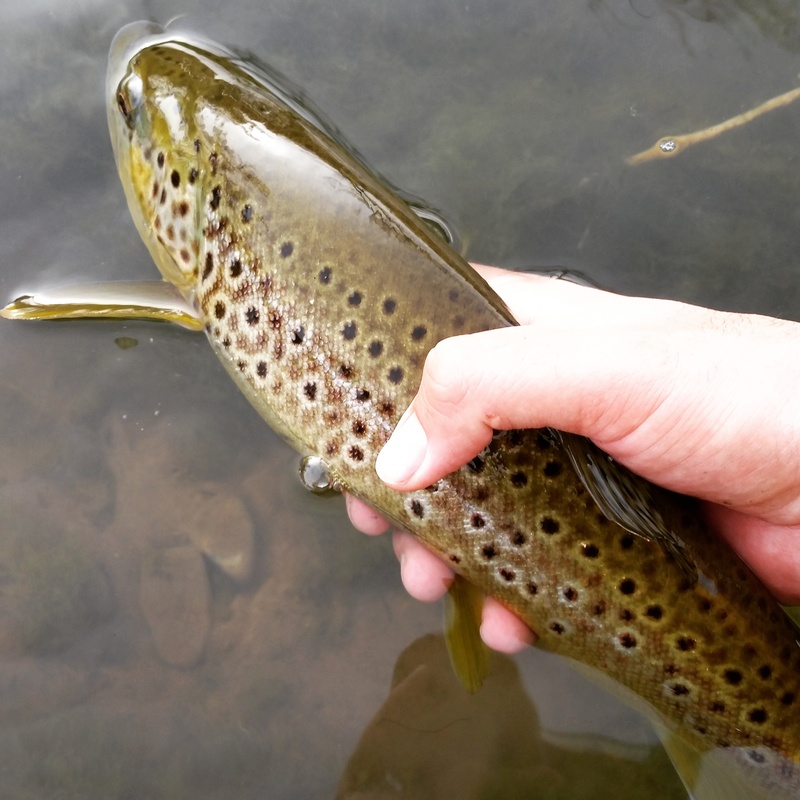 It was a beautiful brown trout. Unbelievably exciting. I screamed, AJ screamed and James — well, he sighed. Fishing continued. I kept casting, but in a different direction now. It was a bit trickier. AJ showed me how to do it at this different angle, but I wasn’t casting all that great and all of a sudden, bam! Another fish on! High fives all around. I even kissed the fish this time. It was another brown trout and just an inch bigger than the last. So, the total for the day was two brown trout, both caught by yours truly! I rubbed that in James’ face. I was on cloud nine. I am in love with fly fishing. I had an advantage having AJ as my mentor. He had all of the right flies, tackle, gear and all I had to do was fish. But it wasn’t as scary as I had built it up to be. With a little practice and a lot of patience, I did ok. It was so much fun. It almost felt like hunting. I felt like I was hunting the fish. It was amazing and so was my guide! If you have a buddy who fly fishes, ask to tag along. They are probably more than happy to show you the ropes. When I caught my fish I couldn’t tell who was more excited — me or AJ. Get out there and try fly fishing. If a gal from Mississippi can do it, then trust me, anyone can! This is a fantastic read. Would love to see the fly catches on the HowBig app. (The app is built for hunters, fishermen/women, and outfitters to connect and share their hunts and catches with other hunters and fisherman, or search for outfitters, create trophy cases, create groups and find local outdoor related events near them. You can download it on iOS and Android.